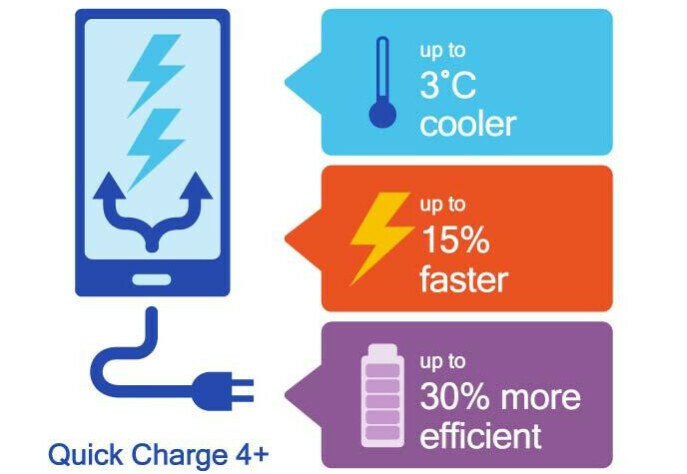 It's been six months since Qualcomm introduced its new Quick Charge 4.0 technology, which faster charging than its predecessor, allowing a smartphone to go from empty to 50% in just 15 minutes. Well, it appears that Qualcomm has managed to stuff in new enhancements to its quick charge technology, but not so many or so important to call the new product Quick Charge 5.0. As such, Qualcomm unveiled the new Quick Charge 4.0+, which mainly offers three significant improvements over the last year technology. The first one is called Dual Charge, which is present in previous versions of the technology but is now stronger than even. With Dual Charge, the charge current will be divided allowing for lower thermal dissipation and reduced charge time (up to 15%). Then, there's Intelligent Thermal Balancing, which conducts current via the coolest path autonomously, thus eliminating hot sport for optimized power delivery. Lastly, some advanced features have been implemented as well, which are meant to enhance safety during charging. For example, Quick Charge 4.0+ can monitor both the case and connector temperature levels at the same time, which should prevent overheating and short-circuit, or even damage to the Type-C connector. Thanks to these three new improvements, Quick Charge 4.0+ can charge a device up to 15% faster, and it's 30% more efficient when compared to Quick Charge 4.0. According to Qualcomm, the first smartphone to include the new Quick Charge 4.0+ technology is the Nubia Z17, which was unveiled earlier this week. The handset comes with a 3,200 mAh battery, a Snapdragon 835 processor, as well as 8GB RAM and 128GB storage. Quick charge is nice but double or triple battery capacity to begin with would be nicer. I wouldn't mind charging overnight if my device had a 10-15k mAh battery. Womp I didn't get the memo!!! Your 4K battery doesn't last all day? My 6S+ lasts 1.5 days on average without a charge. Overnight charging (when I am asleep and not using my phone) works perfect. If I have 45% left at the end of the day to use for the next day, I wake up with 44% battery if I don't charge. Same went for my Note 4, minus the great standby time the iPhone has. What in the world are you talking about? You would need a whole night to charge your phone with qc4.0+.... How did IPhones get brought into this? They know nothing about quick charging. I was under the impression that when said user above said: "Quick charge is nice but double or triple battery capacity to begin with would be nicer. I wouldn't mind charging overnight if my device had a 10-15k mAh battery. ", ..that he wouldn't care about quick charge if phones shipped with better batteries. Contextual relevance when reading is hard I guess? Samsung is, alot are using 3.0. You cannot even buy a QC 4.0 charger anywhere in the first place. Except no phones that have the 835 processor has supported it so far. So this is pretty much a loss for this year. There are no QC 4.0 certified chargers to buy. So even if they did, you'd only have oem charger. Dual charge on my Vivo xplay 5 elite is simply amazing and wouldn't go back. Glad android phones are pushing this tech.